Comitán ( ) (formally: Comitán de Domínguez, for Belisario Domínguez) is the fourth-largest city in the Mexican state of Chiapas. It is the seat of government of the municipality of the same name. It is located in the east-central part of Chiapas, near the border with Guatemala at 16.25°N 92.13°W﻿ / 16.25; -92.13. The municipality has an area of 1,043.30 km² (402.82 sq mi). Its largest other community is the town of Villahermosa Yalumá. The original name given by the local Maya peoples is Balún Canán ("Nine stars"). It was later changed to Comitán de las Flores and, in 1915, to Comitán de Domínguez, after Dr. Belisario Domínguez, who gave a memorable speech in Congress against the dictator Victoriano Huerta for which he was murdered. As of 2010, the municipality had a total population of 141,013, up from 121,263 as of 2005. As of 2010, the city of Comitán had a population of 97,537, up from 83,571 as of 2005. 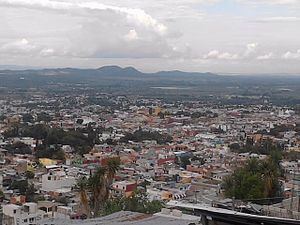 Other than the city of Comitán, the municipality had 340 localities, the largest of which (with 2010 populations in parentheses) were: Villahermosa Yalumá (2,368), San José Yocnajab (1,809), La Floresta (1,743), Los Riegos (1,740), Francisco Sarabia (1,673), Cash (1,429), Señor del Pozo (1,353), Zaragoza la Montaña (1,263), Efraín A. Gutiérrez (1,153), and Chacaljocom (1,056), classified as rural. Tourists in Comitán can see many ecotourism sights including Mayan ruins, Lagos de Montebello which are beautiful lakes complete with cabins and tour guides for those who want them, El Chiflon which is a series of waterfalls (this costs a few pesos to enter), Tenam Puente which is an archeological Mayan Cultural place, and others. Comitán is approximately 2 hours away from San Cristobal by bus and approximately 3 hours away from Tuxtla. It is common for locals to travel 2 hours on the bus to see San Cristobal and then travel an additional hour in order to reach Tuxtla.